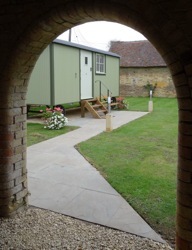 Manor Farm Glamping pods in The Cotswolds is situated in the village of Aston Somerville near Broadway, you will find this hidden gem that fulfils all your needs for relaxation, or rustic celebration. Manor Farm has diversified and landscaped parts of the farmland to develop exciting new glamping opportunities for couples, families or large groups. The environment has been tastefully converted whilst retaining some of the authentic structural features, within an attractive working farm setting. 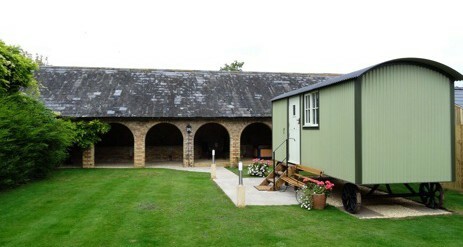 We are the perfect base to explore the North Cotswolds. Our nearest village Broadway, renowned for its chocolate box appeal, boasts a good selection of bars and restaurants, and plenty of independently owned shops to satisfy even the most discerning of shoppers! We are equi-distant from Cheltenham Spa, Worcester, and Stratford upon Avon should you wish to explore further afield. THE PADDOCK is adjacent to the farm buildings and a short walk across the field from the Woodland This well maintained grassy field houses 2 Deluxe Pods (sleeping 2/3 or a family of 4) with decking, BBQs and gazebos, 2 Superior Pods, (sleeping 5) as well as a fully equipped luxurious Safari tent which can sleep 5 Adults or a family group of 7. THE WOODLAND Nestled in our 12 acre Ash and Oak coppice, comprises 8 pods, a central indoor BBQ house, and outdoor fire pit, toilets and shower, as well as basins and washing up sink. This is an eco–site which is fuelled by solar panels and as much of the natural beauty of the woodland is retained to offer a truly unique experience. 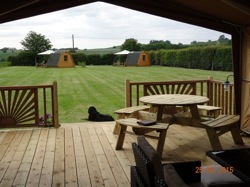 This site is for exclusive group hire and can accommodate Adults groups of up to 20 and family groups of up to 24. RED SKY SHEPHERD’S HUT – our newest addition. Tucked away amidst a range of traditional farm buildings, The Shepherd’s Hut benefits from its own private walled garden, patio, hot tub and BBQ shelter. 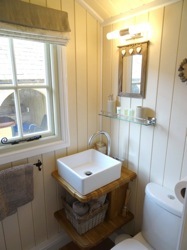 Within this bespoke craftsman built Shepherd’s Hut is a fully sprung foldaway bed, allowing for an easily accessed dining table, fully equipped kitchen, and compact, stylish shower room with toilet and basin. All in all a tastefully decorated, luxurious and romantic place to be for couples! THE WILDERNESS CAMPSITE is situated on the furthest end of the farm land, on the banks of the River Isbourne and is suitable for those who enjoy a more rustic experience. Basic toilet, shower and washing up facilities are provided for seasoned campers who have their own camping equipment. We do also offer whole site hire (The Woodland, plus adjacent large field and the Paddock) to cater for DIY weddings or large family celebrations. 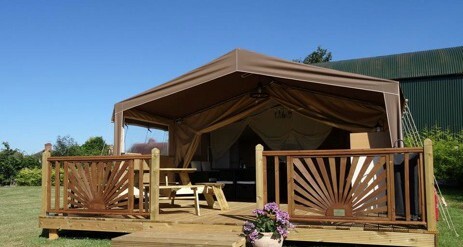 The paddock site is suitable for individuals, families and couples. 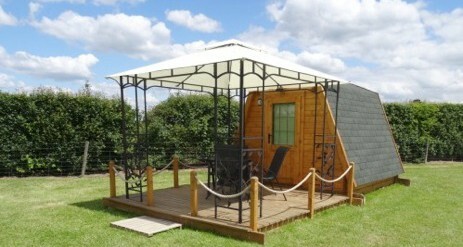 The 2 DELUXE pods here are slightly larger than the woodland pods with an extended shaded decking area with gazebo on which to relax, cook or just enjoy the view over the farmland. Perfect for anyone looking to escape and relax, and the grassy area lends itself to outdoor games in an enclosed, secure setting. The Safari Tent is situated overlooking the expanse of the Paddock and the farmland beyond, lending itself to some spectacular sunsets and stunning views. 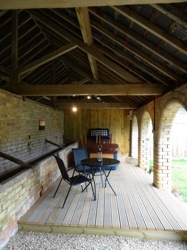 Enjoy sundowners on the decked patio whilst cooking over coals on the BBQ. 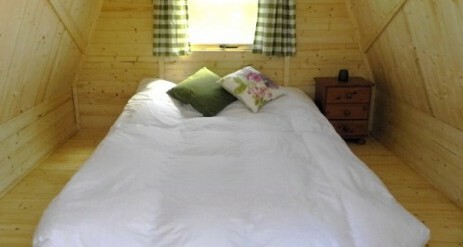 It can accommodate 7 guests in 1 Double room, 1 Triple room and a double sofa bed suitable for children. 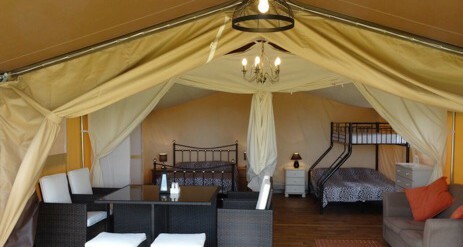 A truly luxurious glamping experience for all…perfect for those who would otherwise not consider camping under canvas! CAMPING in the PADDOCK: Additionally, we allow camping in the Paddock and there are 8 pitches if you wish to bring your own tent or wish to have a combination of hiring pods and camping in tents. Camping packages and services are available, if you are a first time camper or glamper wanting to test out outdoor living. Our accommodation and facilities combined span across one acre of our spectacular twelve acre woodland, leaving you plenty of room to explore. Perfect if you wish to take a stroll alongside the River Isbourne as it meanders through the fields and take in the views. Additionally, the farm is home to Red Deer, Roebuck, a variety of game such as pheasant, partridge, hare, and an impressive number of birds of prey – perfect for those of you who fancy a day of wildlife spotting. Your own private natural retreat. Our woodland glamping site has 8, insulated and double glazed pods with solar powered lighting with heating available in the colder months. There is a large 6m BBQ house with sound system and mood lighting, washing facilities including hot shower, 2 basins and washing up sink and composting toilets. Our original 1936 shepherd’s hut provides kitchen facilities with crockery, cutlery and utensils for cooking as well as a small gas fridge. There is a large seating area surrounding the fire pit which can be used as a BBQ, for cooking, boiling a kettle or just to cosy up around for warmth. 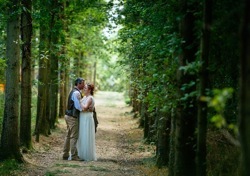 We now have a large grassy field adjacent to the woodland site so that you can host your wedding with a difference! 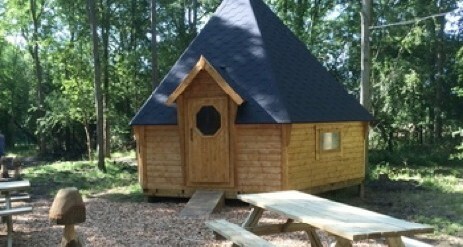 The woodland has 2 useable areas – the main developed area for accommodation and entertaining and another beautiful grassed natural clearing at the end of a tree-lined track. 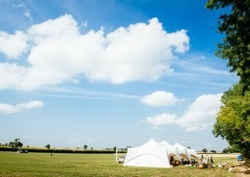 The large field would be suitable for a marquee, parking and additional camping if required. There is access to the footpath and stunning walks through the farm land and alongside the River Isbourne. Here one can enjoy the abundant flora and fauna of the area in peaceful surroundings. There are typical Cotswold towns and villages to explore such as Broadway, Chipping Campden, Snowshill, Stanton, Winchcombe, Moreton in Marsh, Stow on the Wold, and Bourton on the Water to mention a few, and all within an easy driving distance away. Of particular note in terms of tourist attractions, there is the Broadway Tower, Snowshill Manor, Sudeley Castle, Toddington Steam Railway, Hayles Abbey which are worth visiting. For families, the Cotswold Farm Park and Wildlife Park are nearby. Evesham hosts a variety of supermarkets and a good leisure centre with pool, and the tennis club will allow non-members to book a court.